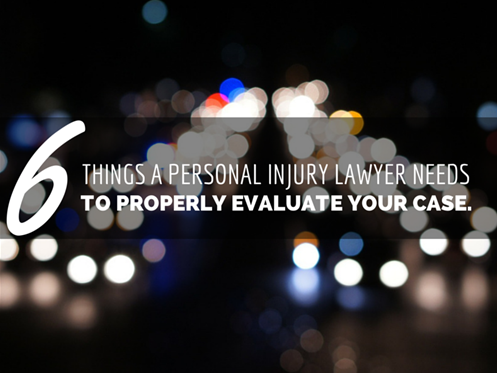 What does a personal injury attorney need to evaluate a case properly? 6. An understanding of injuries and medical care already received. Clients often would like to know what their case might be worth. But early on in the process, it is likely an impossible question to answer. There is just not enough information yet, and the information cannot be complete until much more is known about the injuries, and how long they will take to heal. An early investigation may be crucial to your claim, so you should not delay in seeking the assistance of an experienced personal injury lawyer. Look for a lawyer who practices in injury cases only. Look for a Certified Specialist in PersonalInjury/Wrongful Death law.